Ticks are carriers of various canine diseases and ehrlichiosis is one of the most fatal diseases caused by them. The greatest challenge in battling ehrlichiosis is in detecting and accurately assessing the clinical signs. Over the past several decades, ehrlichiosis has emerged as an important threat to dogs worldwide. During recent years, it has gained the reputation as “the AIDS of the canine world.” Dogs not only become clinically affected with ehrlichia or rickettsia but may also serve as a reservoir host. Canine ehrlichiosis is tick-borne potentially fatal and enigmatic infectious rickettsial disease of dogs, prevalent in India since 1944. It is colloquially known as canine rickettsiosis, canine typhus, idiopathic haemorrhagic syndrome, canine haemorrhagic fever, tropical canine pancytopenia, Lahore canine fever, Nairobi bleeding disease or tracker dog disease in many parts of the world. Its ability to mimic other diseases and devastating effects makes canine ehrlichiosis a deadly disease. The disease often remains undiagnosed in naturally occurring cases in field owing to nonspecific symptoms, species variation, coand concurrent infections, etc. Hence, timely diagnosis in severely affected chronic cases is escaped leading to futile treatment. The disease is caused by obligate intracellular bacteria of genus Ehrlichia of the family Rickettsiacae. Three species of Ehrlichia viz. Ehrlichia canis, E. ewingii and E. platys have been reported in India. Ehrlichia canis, a small and pleomorphic organism that infects circulatory leukocytes, mainly monocytes, causes canine ehrlichiosis. The organism occurs either singly or in compact colonies or inclusions, termed morulae, in the cytoplasm of the infected cells. E. canis, E. ewingii and E. platys are considered strictly canine parasites. Canine ehrlichiosis is transmitted between dogs by the brown dog ticks, Rhipicephalus sanguineus and possibly the American dog tick, Dermacentor variabilis. Ehrlichia infections have frequently been reported in dogs with simultaneous infections with Babesia, reflecting concurrent transmission of organisms from commonly infected reservoir ticks. Ehrlichia species can be transmitted by blood transfusion, so blood donors should be screened. Naturally occurring canine ehrlichiosis is manifested by a wide variety of clinical signs. The greatest challenge in battling ehrlichiosis is in detecting and accurately assessing the clinical signs. The only consistent finding in canine ehrlichiosis is the inconsistency of clinical symptoms. Clinical signs in acute phase of the disease are transient, subtle and mild. Clinical signs mimic those caused by other diseases. Signs may appear 1-3 weeks after infection and often disappear within 2-4 weeks. Acute phase : Mild depression, anorexia, lethargy, fever, and mild loss in body weight, lymphadenopathy and splenomegaly characterize acute phase. Despite significant thrombocytopenia, haemorrhagic diathesis usually does not occur. Also, ocular signs are not commonly seen at this stage. Whenever ocular signs are present, they involve nearly every structure of the eye (including conjunctivitis, conjunctival or iridal petechiae and echymoses, corneal oedema, hyphema, panuveitis, secondary glaucoma, retinal haemorrhage and detachment). The most frequently observed ocular signs in canine monocytic ehrlichiosis are anterior uveitis, retinal vascular engorgement and tortuosity, perivascular cuffing, diffuse retinitis, retinal haemorrhages and detachment. 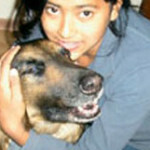 Clinical signs resolve without treatment in most cases and the dog enters into subclinical phase, which is asymptomatic. During acute phase, transient proteinuria without histologic evidence of glomerular disease has been observed. Chronic phase : Dogs unable to eliminate infection enter into chronic phase that is characterized by weakness, depression, anorexia, vomiting, emaciation, pale mucosa, erratic fever, peripheral oedema especially of the hind limb and scrotum, and hepato- and splenomegaly. Haemorrhagic episodes (such as skin petechiae and ecchymoses, buccal haemorrhages, epistaxis, haematuria, haematochezia, haemetemesis and hyphema) are also seen in many cases. Interstitial pneumonia, arthritis, renal failure may also occur occasionally. Increased lung sounds on auscultation are attributable to pneumonic changes in the lungs that develop in canine ehrlichiosis or may reflect concurrent cardiopulmonary disease. Neurological signs (such as depression, ataxia, convulsions, cranial nerve deficit, and head tilt) are also seen in canine ehrlichiosis with or without concurrent babesiosis. Large variations in clinical signs are due to a number of factors including differences in pathogenicity between strains of ehrlichia, breeds of dog, coinfection of ehrlichial species, concurrent infection with other organisms (such as babesia, trypanosoma, dirofiliaria) and/or immune status of the dog. How ehrlichiosis can be cured? Treatment of ailing dogs requires professional skill because of many complications and should therefore be undertaken under the advice and care of the competent veterinarian. Tetracycline, doxycycline, chloramphenicol and imidocarb are the drug of choice and if given timely in appropriate dose schedule are beneficial. Supportive therapy with polyionic isotonic fluids, blood transfusion, and vitamin B complex hastens the recovery. Treatment of severe chronic form of ehrlichiosis is unrewarding in many cases particularly in severely pancytopenic dogs owing to uncontrolled haemorrhages and secondary infections. For the arrest of haemorrhages during severe chronic phase, blood transfusion is undoubtedly a life saving measure of the first order. How ehrlichiosis can be prevented? Prevention of canine ehrlichiosis is possible only with treatment of vertebrate host. Tick population can be controlled by spraying kennels and dipping/ spraying or bathing dogs at an interval of 1-2 weeks, as vector transmission is probably the only means of spread under natural circumstances. Common acaricides such as amitraz, fiproil and pyrethrins are effective in controlling ticks. Long-term use of tetracycline or repository oxytetracycline has been used to prevent or control epizootics of ehrlichiosis. Longer therapy of 1-2 years duration has been recommended in endemic areas so that infected ticks die off. Despite success of the tetracycline in prevention of the ehrlichiosis, it does not seem practical owing to the possibility of future development of resistant strains of E. canis. There is no lasting immunity in case of E. canis infection following treatment. Treated dogs, cleared of infection, become susceptible to re-infection and clinical disease develops despite antibody titre. At present there is no effective anti E. canis vaccine for the prevention or control of canine ehrlichiosis. Because E. canis is not passed transovarially in the tick, it can be eliminated in the environment by tick control or by treatment of all dogs throughout a generation of ticks. Are you giving a nutritious diet to your dog? Ooh! Aah! Ouch! Your pooch might be suffering from arthritis!